Pincus Kolender was born in 1926 in Bochnia, Poland. While antisemitism was commonplace, the large Jewish population in the city allowed the Kolender family to live a quiet life. Things changed in 1936, however, when Pincus’s father, Chiel, lost his job for refusing to shave his beard. In response, Chiel opened a small grocery store on the first floor of the family’s home, where he, Pincus’s mother, Rachel, and Pincus and his older siblings, Abraham and Rosa, all lived. By 1940, the Germans had begun the transformation of the Jewish community in Bochnia into a ghetto. Chiel Kolender was initially able to use his friendship with the president of the Judenrat, the Jewish Council used by the Nazis to administer the ghetto, to protect his family from Nazi persecution, but eventually even that connection was not enough. In 1942, Rachel was executed by SS officers in the ghetto; Rosa was deported to Treblinka, where she was killed; and Pincus and Abraham were sent to Auschwitz, leaving Chiel alone in the ghetto until, he, too, was sent to Plashov, a labor camp, where he was shot and killed. After arriving at Auschwitz, Pincus and Abraham were forced to work in the I.G. Farben factory at Buna until January 1945, when they were sent on a forced march away from the camp ahead of the Red Army’s advance in to Poland. Abraham died during the march, while Pincus survived imprisonment in several more camps, including Nordhausen and Dora, until he made a daring escape in Czechoslovakia by jumping from a transport train late in the war. Pincus hid in the woods for 18 days, until the war ended and the area was liberated by American troops. In 1950, he received a U.S. visa and settled in Charleston, South Carolina, with the help of the Hebrew Immigrant Aid Society. Once in Charleston, he started a successful business and married Renee Fox, a fellow Holocaust survivor. A 1997 oral history interview with Pincus is available from the Lowcountry Digital Library at http://lcdl.library.cofc.edu/lcdl/catalog/lcdl:11827. The video documentary For Every Person There Is a Name, featuring three Charleston-area Holocaust survivors, including Pincus, is also available. 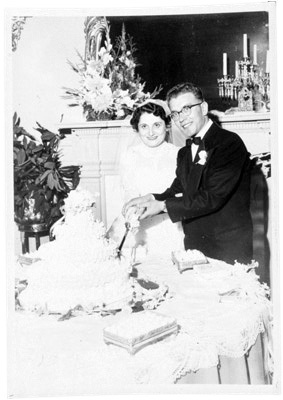 Pincus and Renee Kolender cutting their wedding cake on November 1, 1953 in Charleston, SC at the Francis Marion Hotel.